An Ontario priest has been arrested on suspicion of sexually abusing a 12-year-old boy, police said Tuesday. Jose Alejandro Castillo, 57, pastor of Our Lady of Guadalupe Church in Ontario and known as "Father Alex" to parishioners, was arrested Monday at 3:30 p.m. at his Ontario home. After a three-month investigation, Ontario police say they confirmed inappropriate sexual contact by Castillo, with eight separate acts committed against the boy over a three-month period in 2008, said Sgt. David McBride. The San Bernardino County district attorney’s office issued an arrest warrant charging Castillo with eight counts of lewd or lascivious acts with a child younger than 14. 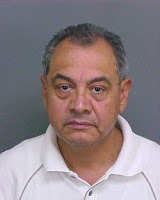 Castillo was removed from active ministry in June after he was accused, by relatives of the victims, of molesting two adolescent boys. The Diocese of San Bernardino took it to police, and the allegations were made public nearly three months later in a letter read at weekend Mass at the four churches where he had served. "This is obviously a very sad day for our diocese and especially for the good people of our Lady of Guadalupe parish," said Diocese of San Bernardino spokesman John Andrews. "We take a moment to express our sorrow and our regret to all victims of abuse in our church and in our society; this issue is a very terrible thing." Police determined there were three other victims -- a 16-year-old boy at Our Lady of Guadalupe and two adults at other parishes -- but declined to file charges because the statute of limitations for the crimes had expired. Detectives also are investigating another alleged incident between Castillo and a 14-year-old boy while the priest was serving at Our Lady of Guadalupe Church. Castillo is being held on $1-million bail and could face up to 22 years in prison if convicted, police said. A member of the diocese since 1988, Castillo has worked at Our Lady of Guadalupe since 2003 and was named pastor in 2006. He also has worked at St. Anthony in San Bernardino (1988-1989), St. Catherine of Siena in Rialto (2000-2003) and St. George in Ontario (2006-2008). Before that, he worked for several years at the California Catholic Conference, which represents the state’s Catholics on legislative and social issues. Investigators suspect there may be other victims and urge anyone with more information to contact Ontario Police Det. Mark Guski at (909) 395-2726.